Recently, I wanted to learn how to solder so I could plumb my satellite TV signal up to my bedroom from the digibox downstairs. So I searched for YouTube videos on basic soldering. When I was young, I used to watch the UK weekly pop programme, Top of the Pops. I particularly liked seeing what the drummers were doing. A few years later, I sat down at a real drum kit and realised I knew how to play. I’d never had a lesson but I had learned how to play the drums by watching other drummers. Clearly, for me, watching how others do things to helps me to glean tips for myself, rather than reading books or blog posts. 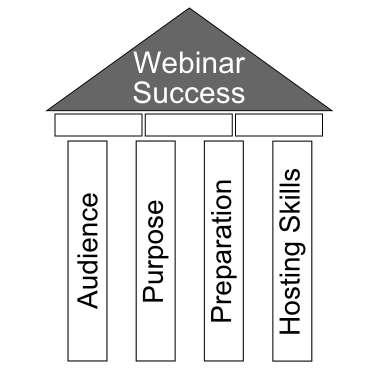 So when I was wondering how to improve my Webinar hosting skills, I thought about using the same approach. The organisations I have worked for have always recorded all Webinars so I tried Googling for recorded Webinars and, of course, I found thousands, openly available. I found the raw recordings much more interesting and useful than ones which had been carefully edited and processed because learining from others’ mistakes and how they overcame them can be powerful (as I hope you have found in these blog posts and podcast episodes). Most importantly, I watched recordings of my own Webinars. This was very uncomfortable! It was like being back at College where my violin tutor used to video record the students once a year and make us watch ourselves performing to spot how we could improve. It’s impossible to watch Webinar recordings without picking up tips and techniques. 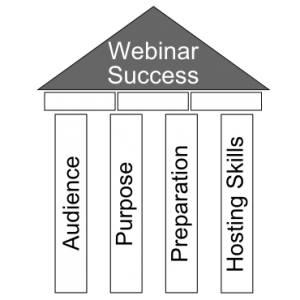 Put yourself in the position of the audience and think about the Webinar Quick Tips Four Pillars of Webinar Success- can you see evidence of the host taking these into account – or not? Search on Vimeo and YouTube or sign up for Google alerts for recorded Webinars and watch as many as you can. When you notice a Webinar Quick Tip, please send it in using any of the methods in the side bars or at the top of this page. I look forward to seeing what you come up with.